When you hear the name Zillow, you may think first of the online real estate marketplace’s real estate listings — but since 2008, the Seattle-based company’s Mortgage Marketplace division has also been offering consumers a way to obtain mortgage loan quotes from multiple lenders. “The whole idea is to help consumers make more informed decisions about their homes and the homebuying process,” said Erin Lantz, vice president of Zillow Mortgage. Zillow Mortgage faces stiff competition from an assortment of online mortgage companies, including LendingTree, the category leader. But Zillow’s exploding consumer traffic on the real estate side could help the Seattle firm bridge the gap. To date, mortgage ad revenue has not given the company a significant financial pop compared with agent and broker advertising revenue. At some point, you can imagine the Zillow platform offering an end-to-end experience for both consumers and for agents — a lead-to-close offering. You can imagine the Zillow platform offering an end-to-end experience. The service allows borrowers to get custom loan quotes without revealing personally identifying information and has already been integrated into Trulia’s mortgage shopping tools. Zillow Mortgage features two products. First to market was Custom Quotes, which enables consumers to obtain personalized, real-time quotes from lenders that match the information they input. Lantz said on average, users receive more than 30 quotes per request. “The intention was basically to get an apples-to-apples quote from lenders,” Lantz said. But after doing extensive consumer research, Zillow found that consumers still felt overwhelmed by the process of getting a mortgage and developed a second tool called Long Form. Consumers use Long Form to input the information they need, and Zillow connects them with lenders who may be the best fit for their needs. Long Form gives consumers “information like how close a lender is located to the consumer, what their specialties may be and what unique loan products they offer,” Lantz said. Zillow’s cache of lenders who participate is run much the same way as the company runs its agent listings, Lantz said. Lenders purchase advertising on the website. Potential buyers who use Zillow Mortgage’s products use the service for free. 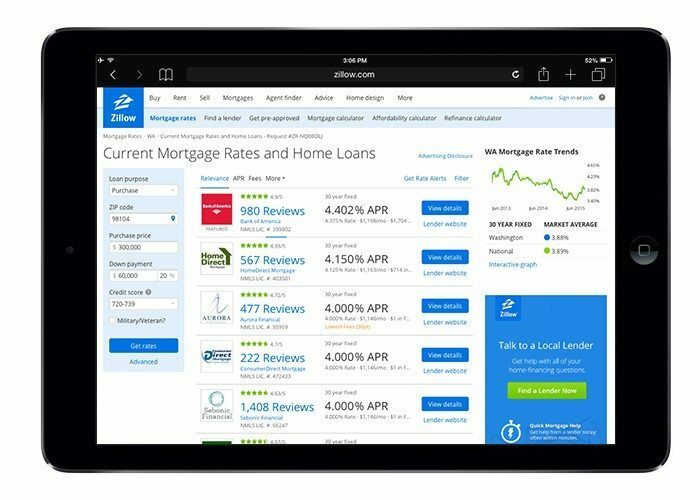 Zillow also features consumer reviews of their experience with lenders, and the company has collected 150,000 reviews to date. Zillow also has a mortgage calculator, and all of its products can be used on mobile devices. The platform also does more than allow consumers to shop for loans. Thanks to the data the company has collected from both consumers and lenders, it has also been able to publish several studies of mortgage industry trends. Recent reports include one which concluded that borrowers with low loan amounts tend to pay about 10 percent more for every dollar than borrowers with high loan amounts. Another involved interviews with experts who said it’s easier than ever to get a mortgage, but some renters are still content to put off their home purchase. Zillow Mortgage also features educational tools to help consumers better understand the mortgage application process. Although the focus of Zillow Mortgage is to connect potential buyers with lenders, Lantz noted that because more than half of users who use Long Form contact a lender before looking for a real estate agent, it’s becoming more important than ever for lenders to work with agents so they can connect them with consumers early in the process.